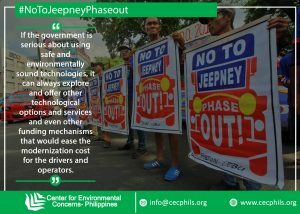 The Center for Environmental Concerns – Philippines, Inc. (CEC) supports the nationwide action of the transport groups opposing the jeepney phase-out. It joins calls for a thorough and inclusive review of the Public Utility Vehicle (PUV) Modernization Program to ensure that it is based on a clear plan to effect a modern mass transportation system that is clean, safe, affordable, accessible, and that also considers the welfare of millions of jeepney drivers, operators and their families. While we agree that there is a need to upgrade and modernize the current transport vehicles into environmentally-sound ones, the current DOTr and LTFRB “modernization” scheme is more like a red herring that would surely displace the livelihood of at least 400,000 jeepney operators and drivers nationwide and entrap the riding public in runaway cost of fares. The DOTr scheme passes the cost of the prescribed new solar-powered/electric/Euro-4 jeepneys which amounts to P1.5M per unit to the common driver-operators who barely earns P500 a day. In addition to this, for the drivers to avail of the new franchise scheme, he/she should have at least 10 units equipped with modern technologies (GPS, speed limiters, WIFI, among others) which are impossibly expensive for the impoverished jeepney drivers to buy and maintain. Clearly, only the big and powerful corporations can engage in such a costly undertaking. It is tantamount to another corporate takeover of a major public utility in the country. We need only look at the MRT privatization experience to grasp how the private sector can truly exploit its control of a common good as the public transportation. At the end of the day, it will still be the commuters who will be made to shoulder the cost of the modernization scheme. Can government guarantee its affordability to the riding public? If the government is serious about using safe and environmentally sound technologies, it can always explore and offer other technological options and services and even other funding mechanisms that would ease the modernization cost for the drivers and operators. For one, in keeping with climate justice, the country’s use and promotion of clean and renewable technologies should be borne by developed countries or those whose current and historical emissions have brought about climate change. Access to clean and safe technology should not be a burden to people already saddled with low wages, inadequate income, joblessness, and high prices. If the government is serious about modernizing the transport system, it has to be anchored on the development of a mass transport system, where the jeepneys provide greater accessibility for the commuting public. The government, through the DOTr, needs to consider subsidizing the modernization program for the hundreds of thousands of the jeepney transport sector, which will benefit, as well, the millions of commuting public and ensure national productivity. Displacing millions of people directly relying on the jeepney transport sector through a poorly developed transportation modernization scheme is a great injustice to the jeepney operators and drivers who have provided accessible and affordable transportation, where government has failed miserably.